FILE - Myanmar’s radical Buddhist monk Ashin Wirathu. “He has been famous because of the interviews and because of the posts in the local media,” said Thitsa Hla Htway, secretary of the Foreign Correspondents' Club of Myanmar. Though Myanmar has long struggled to contain religious enmity, the story was not often heard outside of the country due to its isolation. That changed with a 2013 TIME magazine issue that put Wirathu on the cover and sought to explain the man's connection to the mayhem. 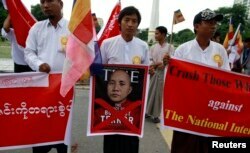 FILE - People demonstrate against Time magazine in Yangon June 30, 2013 when its cover story dubbed radical Buddhist monk U Wirathu, "The Face of Buddhist Terror". “We see the occasional profile piece and don't find those terribly helpful. Most foreign readers, particularly in the West, regard Buddhism as a tranquil religion of peace, so editors have endless fodder in stories of an extremist monk who preaches hatred."